Vacation? Business trip? Family Reunion? Whatever the destination, traveling when in recovery can be an additional stress. There are ways to minimize that stress and spend more time enjoying the experience. The key to successful travel is planning ahead. 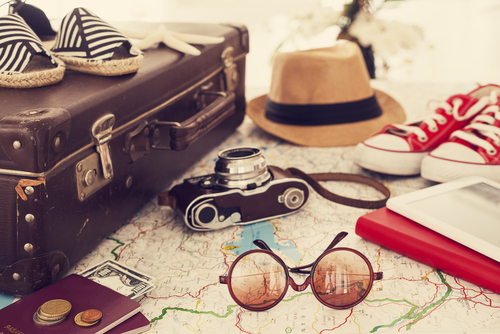 Packing may seem like a no-brainer, but you may not have thought about some of these helpful items that will ease travel stress and keep you focused on your recovery. First, bring food. Depending on the specifics of your trip, pack snacks and potentially small meals to ensure you always have access to at least moderately healthy food and lots of water. It has been proven that triggers are harder to beat when you are hungry. When staying in a hotel, call ahead and ask if they have mini-bars in the rooms, and if so, ask them to remove it or empty it before your arrival. It is surprisingly common, so don’t be shy about your request. Also, find out if they offer happy hour specials or drink specials in the lobby or bar. If so, find out the times and make other plans during those times. If you have a long layover between flights, schedule a call to someone within your support system and chat with them. This keeps you accountable and allows you to be proactive and take responsibility for yourself. Being proactive minimizes triggers and builds confidence in your own ability to stay sober. While this may not always be an option, but when you can, try to travel with a sober buddy. Having someone with you that shares your passion for recovery, either theirs or yours, can remove a lot of excess pressure and help keep temptation out of your mind. Focusing on the environment around you, the activities you have planned, and the people you are with prevent your brain from dwelling on your triggers. Stay in the moment and focus on things within your control. Having a companion with you can make this a lot easier, and sometimes even more enjoyable. If you can’t have them with you physically, keep them nearby via phone or text. Don’t be afraid to reach out to your support system should you need. Hired Power understand that having a sober companion isn’t always easy to come by. They offer multiple services that provide sober companions or Certified Personal Recovery Assistants. These people are highly trained professionals that understand addiction, triggers, and they will help keep you accountable. For more information, please call Hired Power at 800-910-9299 to discuss which option is the best fit for you.